Lafayette drivers can feel the power of Best-In-Class V8 towing and a max towing capacity of 12,750 pounds on the all-new RAM 1500. Choose from the 5.7L HEMI® V8, the 5.7L HEMI® V8 with eTorque, and the 3.6L Pentastar® V6 with eTorque. The innovative eTorque mild hybrid system replaces the conventional alternator with belt drive, 48-volt battery powered motor generator which increases performance and capability. The 2019 RAM 1500 features Active-Level™ Four Corner Air Suspension which provides automatic load leveling and increase performance and capability. 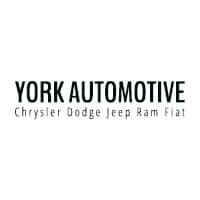 Feel the power of the RAM 1500 at York Chrysler Dodge Jeep Ram FIAT. The all-new 2019 RAM 1500 offers increased towing, tough HEMI® engine options, and an innovative hybrid system that increases both performance and capability. Compare the power of the 2019 RAM 1500 to the Chevrolet Silverado 1500 and the GMC Sierra 1500, or experience the performance of the RAM 1500 in person at York Chrysler Dodge Jeep Ram FIAT in Crawfordsville.